Royal Jelly is a milk like secretion made by worker bees in the hive. 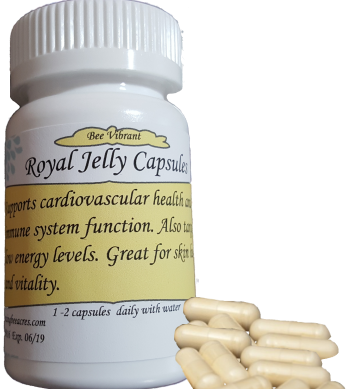 It is called Royal Jelly because it serves as the sole food for the queen bee. It supplies all the B-vitamins, vitamins A, C, D, E & K, more than a dozen key minerals. 18 amino acids, and other important constituents, including nucleic acids (DNA and RNA). Adenosine triphosphate (ATP), adenosine diphosphate (ADP) and adenosine monophosphate (AMP) are also found in Royal Jelly. Caution: Bee products may cause an allergic reaction in some people. Discontinue use if this occurs. If you are pregnant or breast feeding, consult your health care professional before using this product. don't know yet, and I am sure it will give the results I'm looking for because dancing Bees Acres is fine quality products. I love the smell of the royal jelly I can tell that it is pure. I used to work for a naturalpath doctor and he recommended this product and took it himself.